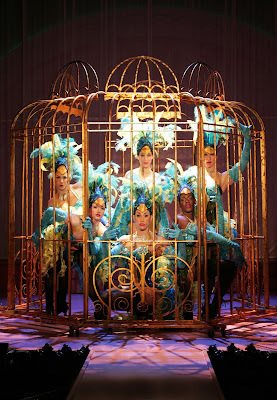 LOOK OVER THERE AT THE FABULOUS AND FLAMBOYANT "LA CAGE AUX FOLLES"
Who is a mother? The woman who gives birth to you and then abandons you, rarely to be seen again or the man who wipes your brow when you are ill with fever and is there every day faithfully by your side? For Jean-Michel, the question becomes critical when, at the age of 24 years, he announces his engagement to the delightful Anne. Her father is the head of the "Tradition, Family and Morality Party," a conservative political party dedicated to the goal of closing all drag nightclubs. Since Jean-Michel's "parents," Georges the owner and master of ceremonies and Albin, the flamboyant transvestite star "Zaza," are intimately involved in that targeted enterprise, there are bound to be fireworks when the two prospective sets of in-laws meet. Be prepared to jump aboard the merry-go-round that is "La Cage aux Folles," which literally means "the cage of mad women," parading across the stage of Goodspeed Musicals in East Haddam. Already extended to Thursday, September 10, this "gay" production enjoys a book by Harvey Fierstein and music and lyrics by Jerry Herman. Come to Saint-Tropez for the grand and gaudy adventure, with enough glamour and glitz to light up a third world country. When Jean-Michel (Conor Ryan) comes home with his good news, he urges his father Georges (James Lloyd Reynolds) to tell his "mother"Albin to absent himself from the family home. He also wants the apartment redecorated in a pious manner, even though it will still be pink, and asks their butler Jacob (Cedric Leiba, Jr.), who considers himself the maid, to tone down his outrageous persona. Thankfully, Jacob doesn't really listen. 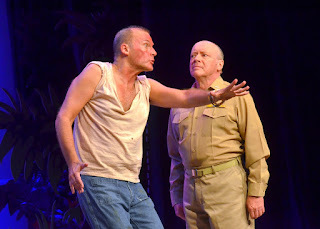 The dedicated Albin ( the wonderful Jamison Stern) is understandably hurt by Jean-Michel's attitude but reluctantly agrees to appear as a macho "Uncle Al" to assuage his feelings. 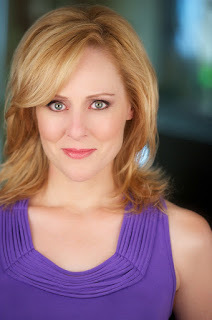 The arrival of sweet Anne (Kristen Martin), her agreeable mother (Stacey Scotte) and her staid and starched father (Mark Zimmerman) set the stage for riotous rockets and colorful explosions worthy of a Fourth of July. Timeless tunes like "I Am What I Am," "With Anne on My Arm," "The Best of Times," "Look Over There" and "La Cage aux Folles" ring out in splendor as do the numerous dance numbers choreographed by Ralph Perkins, executed by the statuesque Les Cagelles who are dressed to the nines in feathers and fur, sequins and satin by Michael McDonald. Rob Ruggiero has outdone himself in this wildly tender musical of love, understanding and forgiveness. For tickets ($27 and up), call Goodspeed Musicals on the Connecticut River in East Haddam at 860-873-8668 or online at www.goodspeed.org. Performances are Wednesday at 2 p.m. and 7:30 p.m., Thursday at 7:30 p.m. (and selected 2 p.m.), Friday at 8 p.m., Saturday at 3 p.m. and 8 p.m. and Sunday at 2 p.m. (and selected 6:30 p.m.). Drape yourself in a feathery boa and get ready for some flamboyant fun as "La Cage aux Folles" tickles and tantalizes your fancy. TOP: DONNA ENGLISH AS MAMAN IN "MY PARIS"
A mystique of vivid colors swirls around the aura of artist Toulouse-Lautrec. Get ready to kick up your heels and swing your ruffled skirts as the can-can dazzles your senses. It’s Paris at its most gay and festive, a celebration of the arts when the princes of the painting world were prominent and passionate. During these slightly decadent and unruly festivities, one personage emerges from the provocative milieux: Henri Marie Raymond de Toulouse-Lautrec-Monfa, an impressionist of well deserved renown. Born in the mountains of Albi, France in 1864, this intriguing artist, who had a painting of a young laundress sell at auction a decade ago for a record $22.4 million, will be the subject of a new musical “My Paris” at the Norma Terris Theatre in Chester, also known as the Little Goodspeed. From Thursday, July 23 to Sunday, August 16. with book by Oscar, Tony and Pulitzer Prize winner Alfred Uhry, English lyrics and musical adaptation by triple Tony-winner Jason Robert Brown, music and lyrics by legendary French performer Charles Aznavour and direction and choreography by Kathleen Marshall, “My Paris” is sure to be magnifique! As a young boy, Toulouse-Lautrec (Bobby Steggert)was plagued with health problems that affected the bones in his legs and caused them to be child-sized even as an adult. His talents in art were a source of great comfort and he became a skilled Post-Impressionist painter, art nouveau illustrator and lithographer. 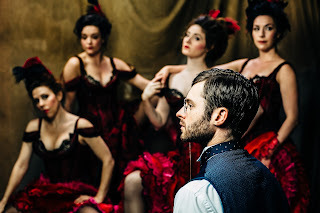 The technicolor world of Le Moulin Rouge, in the Montmartre section of the city, was an exciting, bohemian lifestyle that attracted him, as well as did his comrades like Van Gogh, Gaugin and Cezanne. Immersed in this evocative world, he painted and illustrated posters of the unique characters who peopled his gaudy and exotic world, from prostitutes to philosophers, singers to sinners, dancers to debutants. While his career spanned only two decades, he was prolific in his production of over 700 canvases, almost 300 watercolors, over 350 prints and posters and over 5000 drawings. Alcoholism was a factor in his early death. Henri’s parents were first cousins and that intermarriage, a ploy to keep land in the family, may have caused his genetic bone problems, ones that gave him great pain. His legs kept breaking and stopped growing by his age 11. While his family was wealthy and French royalty, doctors were unable to elevate his distress. His father Papa, Alphonse, (John Glover) was an active and viral man, and could not understand the limitations of his son and heir. While Henri died at 36,after having achieved success in his lifetime, Maman lived until 1930, actively protecting his artwork and creating a Toulouse-Lautrec Museum in his hometown of Albi. For tickets ($45 and up), call 860-873-8668 or online at www.goodspeed.org. Performances are at 33 North Main Street, Chester on Wednesday at 2 p.m. and 7:30 p.m., Thursday at 7:30 p.m., Friday at 8 p.m., Saturday at 3 p.m. and 8 p.m. and Sunday at 2 p.m. and 6:30 p.m.
Come discover the rich and fragrant flavor of Paris and the frantic gaiety of its colorful canvases, with just a tinge of a soul of sadness. All summer long, outdoors on the garden patio, on Friday nights July 24, August 7 and 21, as well as fall dates September 11, October 16, November 13, December 11, 17 and New Year’s Eve, Sayers is conjuring up evenings combining great dining with audience participatory mystery excursions. As you delight in a meal of your choice, you get to be an amateur Sherlock Holmes or Miss Marple. Select from a choice of five appetizers like fried calamari, succulent and crispy and ready to be dipped in a zesty marinara sauce, or nine entrees like filet of sole florentine on a bed of tender baby spinach, awash in a savory sauce of white wine, lemon and garlic and two desserts like Godiva Tiramisu, created when you soak Godiva liquor over lady fingers and stuff with mascarpone cream and espresso. While feasting, a troupe of actors with mingle and schmooze at your table dropping clues about their character and how they interact with the other players, fair and foul. When the murder occurs, and it definitely will, you are right on the scene with or without your magnifying glass to deduce and deduct all the evidence. First up on Friday, Juy 24, you’re invited to partake of “Murder on Auction” when a lost painting by a legendary comedian ‘Red’ Shecky goes to bid to pay off his gambling debts. Where’s the honor in that? Apparently, Shecky isn’t a much better artist than he is a performer. 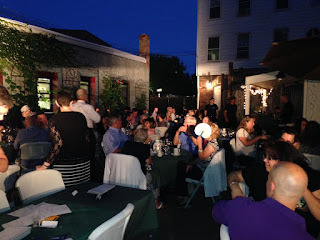 On Friday, August 7, the game is politics and not a typical fundraiser, but an extraordinary ‘funraiser.’ The campaign chest is empty and needs filling and the usual suspects are all under the grilling light of truth or dare when a murder is uncovered. Register for a semester of college on Friday, August 21 for “The Sunny Day in ‘Staven.” Unpack your bags and prepare to move into the dorms at ‘Staven University where nerves and tensions are climbing higher than the clock tower. Watch out for a well known personality who is slated to appear, without a red carpet invitation, to enroll her precious offspring for class. This pun on East Haven is destined to end in a collegiate crime scene. For reservations, call 203-865-4489. Tickets are $55 for dinner and the show, while drinks, tax and tip are extra, Doors open at 6 p.m. and the show at 7 p.m., outdoors on the garden patio if weather permits. Reserve early as shows sell out. Come take part in the festivities and frolic and fine food as Consiglio’s adds mystery and murder to its menu. Mange! 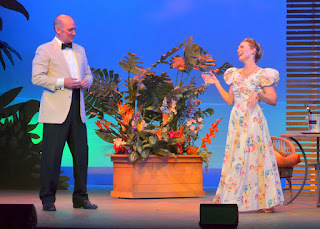 Luke Hamilton as Sonny and Amandina Altomare as Clio/Kira in "Xanadu"
Myths and muses, romance and roller skates, seem an unlikely marriage but in musical comedy anything is possible. To prove the point, the Connecticut Repertory Theatre Company on the campus of the University of Connecticut at Storrs, in the spacious air-conditioned Jorgensen Theatre, is offering up a heavenly concoction with ambrosia and cherries on top: "Xanadu," with book by Douglas Carter Beane and music and lyrics by Jeff Lynne and John Ferrar. Geographically Mt. Olympus and California's Venice Beach seem a gazillion miles apart but until Sunday, July 19, the twain shall meet in a delightfully light and fluffy pink cotton candy confection sure to sweeten you up. Come meet chalk artist Sonny Malone (Luke Hamilton) who has just finished a mural of the muses from Greek mythology on a wall at the Santa Monica pier and is so critical of his work he is contemplating suicide. Arriving just in the nick of time is Clio, (Amandina Altomare) who has assumed leadership of her muse sisters, complete in disguise as an Australian roller skater with leg warmers, springing to life from Sonny's artwork. Clio, now renamed Kira, finds herself in the year 1980 with a major task to complete: to inspire Sonny to believe in himself and complete his dream of opening a tribute to all the arts: a roller disco. Two of her sisters, however, Colliope (Steve Hayes) and Melpomene (Ariana Shore) want her not only to fail but to anger their father Zeus by falling in love with Sonny, a mere mortal. As Kira, Clio introduces Sonny to a big real estate tycoon Danny (Dirk Lumbard) who has the perfect location for the anticipated arts center. 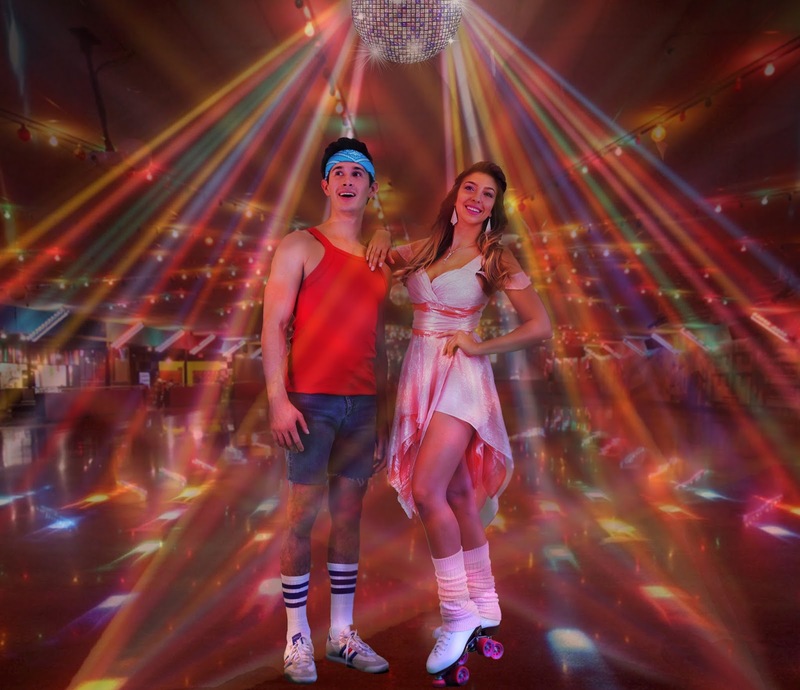 With strange magic and some mighty manipulation, Club Xanadu becomes a riotous roller skating reality, thanks to the help of all the muses (John Brantley III, Connor Donnally, Jayne Ng, Taylor Alexander Stutz and Annie Wallace). They add fun and frolic as they help croon such tunes as "I'm Alive," "Magic," "Suddenly," "Don't Walk Away," "Evil Woman," "Fool" and "Xanadu." Vincent J. Cardinal directs this tribute to love and artistic endeavors, with snazzy costumes by Lisa Loen and bouncy choreography by Cassie Abate. For tickets ($10-55), call the Connecticut Rep at 860-486-2113 or online at www.crt.uconn.edu. Performances are Tuesday, Wednesday and Thursday at 7:30 p.m., Friday and Saturday at 8 p.m., with matinees at 2 p.m. on Wednesday, Saturday and Sunday. Discover your own Xanadu, with the mortals at Venice Beach or with the gods on Mt. Olympus. Your delightful and heavenly choice! If you were a prospector looking for gold, you would be advised to take your pickaxe and pan to Waterford. There you are guaranteed to strike the Mother Lode provided you are seeking gem stones and precious minerals in the entertainment category. For Waterford is the long time site of the Eugene O’Neill Theater Center, the place where traditionally new productions are incubated and launched. Now in its 51st season, this yet-to-be discovered by many “theatrical jewel" has a summer packed with rich veins of gold. The month of June saw the National Puppetry Conference exploring and experimenting with furry and feathered creatures of all shapes and sizes, under the auspices of Artistic Director Pam Arciero. Her incredible background at “Sesame Street” and beyond makes her an excellent “puppeteer” to lead this colorful parade of creativity. The month of July is shared by the National Music Theatre Conference, under the leadership of Paulette Haupt for over three decades. 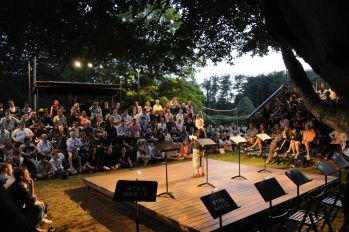 A trio of new musicals have been selected from more than 100 submitted: “Slaughterhouse-Five,” music by Jed Feuer and book and lyrics by Adele Ahronheim; “We Live in Cairo,” music by Daniel Lazour, lyrics of Patrick Lazour and book by both men; and, “ZM,” music by Mark Hollmann, book by Greg Kotis and lyrics by both men. Staged readings are taking place until July 10. Come experience Kurt Vonnegut’s classic novel as it explodes into musical life, join a revolution by youth in Egypt and watch how an innocent sandwich transforms people into zombies. Also in July take a trip on the wild side at the National Playwrights Conference led by Artistic Director Wendy C. Goldberg who has been spearheading this project for over a decade. An unbelievable 1300 play submissions were received and whittled down to a promising eight: “Leftovers” by Josh Wilder; “Good Ol’ Boys” by Joe Waechter; “End of Shift” by Jenny Connell Davis; “No One’s Sonata” by Steven Sater; “Cardboard Piano” by Hansol Jung; “Halftime with Don” by Ken Weitzman; “Nomad Motel” by Carla Ching; and “Slow Food” by Wendy MacLeod. Be intrigued by staged readings until July 25, of plays that deal with such diverse topics as wishes, a mysterious giant deer, a hero’s tribute, a musical anniversary party, a secret marriage in a war torn land, a football star’s sacrifice, two kids who find each other and how an anniversary meal has a dessert of question mark pie. From July 29 to August 8, the O’Neill welcomes cabaret performers for intimate evenings of musical delight. Go to www.theoneill.org or call 860-443-1238 for specific dates and performers. General admission to the plays and musicals is $28 and for the cabaret $35 and $50, with premium seating available. Spoiler alert: Shirley Jones’ show on August 7 is already sold out. The Blue Gene’s Pub is available before and after show times for some smooth libations. Be sure to check out the row of New England style housing that has been newly erected for all the O’Neill guests and visitors on site. Strike it rich in the gold mine that is the Eugene O’Neill Theater Center and stake your claim for exciting and innovative entertainment. Warm tropical breezes blow, fluttering coconut palm fronds and rustling the coral beaded sands of the South Pacific. Into the idyllic scene come stealing the evidences of conflict as the shadows of World War Ii invade the island's peacefulness. In this enchanted setting, the French planter Emile de Becque sets his sights on a young naive Navy Ensign Nellie Forbush one enchanted evening and love blooms like a fragile frangipani flower. 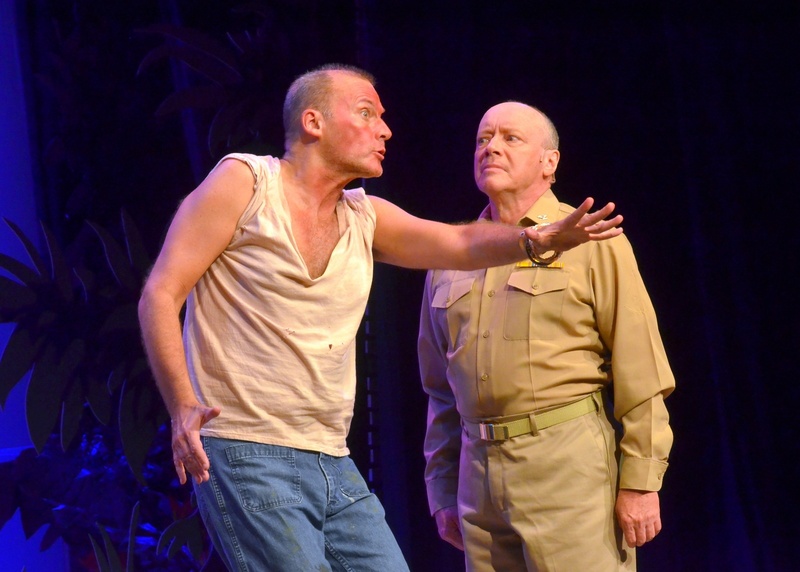 For lessons in how to make “happy talk” or when to wash annoying nuisances like men out of your hair, look no further than Ivoryton Playhouse’s stirring production of “South Pacific” until Sunday, July 26. This glorious musical world has been adapted from a series of prize winning short stories by James Michener. David Pittsinger is charismatic with a French flair as the mature plantation owner Emile de Becque who falls for the eternally optimistic and much younger Navy nurse from Little Rock, Arkansas Nellie Forbush. Their lives are complicated by World War II and his past, the racial prejudices of the time, and the differences in their backgrounds. Adrianne Hick is a bubbly, energized and thoroughly adorable Nellie, ready to leap lagoons for love. After a whirlwind courtship, the two encounter a crisis in belief systems and Emile volunteers for a dangerous mission with Lt. Joe Cable (Peter Carrier) to spy on the Japanese. Some of the show’s lighter moments center on the enterprising and eccentric super saleswoman Bloody Mary (Patricia Schuman, who is married to David Pittsinger) who bargains with the cee bees over everything from grass skirts to shrunken heads to her daughter Liat (Annelise Cepero), while Luther Billis (William Selby) as head of his unit maneuvers and manipulates events and people for his own purposes, often with startling results. R. Bruce Connelly and Tom Libonate play the military officers who coordinate the war effort. For tickets ($42, seniors $37, students $20, children $15) call the Ivoryton Playhouse, 103 Main Street, Ivoryton at 860-767-7318 and online at www.ivorytonplayhouse.org. Performances are to Wednesday and Thursday at 7:30 p.m., Friday and Saturday at 8 p.m., and 2 p.m matinees Wednesday and Sunday. David Edwards directs and choreographs this classic favorite, with stunning sunset lighting effects by Marcus Abbott. For a truly enchanted evening, take a slow boat to the islands of the south Pacific for some mangoes, bananas, frangipani flowers, lessons in tolerance and heartfelt romance. Be sure not to miss this boat.